See attached image. “Day” should be replaced with “Date”. Located in "Customize" —> click the cog next to "Publish" —> click "Schedule"
The control should be able to be re-used for multiple settings (currently it can't). Changes to the setting should sync into the control. The defaultValue param should be replaced with using the value that is provided to the setting when instantiating (see #37964). The time portion the control should be able to be optional. The maxlength is not appropriate for number inputs. screen_shot_2017-09-28_at_18.39.07_480.png​ (21.8 KB) - added by melchoyce 19 months ago. 42022.diff​ (19.5 KB) - added by afercia 19 months ago. 42022.2.diff​ (26.2 KB) - added by westonruter 19 months ago. 42022.3.diff​ (37.9 KB) - added by westonruter 19 months ago. 42022.4.diff​ (43.1 KB) - added by westonruter 19 months ago. nav-menu-name-before.png​ (39.3 KB) - added by westonruter 19 months ago. nav-menu-name-after.png​ (38.6 KB) - added by westonruter 19 months ago. 42022.5.diff​ (1010 bytes) - added by westonruter 19 months ago. hide-date-when-time-not-included.png​ (116.0 KB) - added by westonruter 19 months ago. 42022.6.diff​ (2.2 KB) - added by westonruter 19 months ago. 42022.7.diff​ (2.4 KB) - added by westonruter 19 months ago. date-with-description-without-time.png​ (49.9 KB) - added by westonruter 19 months ago. date-with-time-and-description-and-notifiations.png​ (66.2 KB) - added by westonruter 19 months ago. This is a requirement of the current WordPress coding standards and should be implemented. 42022.diff​ far from being a real patch, serves the purpose to highlight what needs to be done. If fixes also a few missing labels (also in other places in the Customizer) and avoids to print out empty labels. Again, please remember that any form input needs to be labeled. since it is visually hidden, it can be expanded with some more meaningful text. There are many other pending a11y issues in the Customizer and I'm a bit surprised that, after so many recent improvements, very basic things like valid and semantic HTML are so overlooked. I haven't seen so much progress in this regard, and I'd really like to see more focus on producing at least valid HTML. Hopefully, semantic HTML. This kind of HTML is, honestly, something that WordPress shouldn't, ever, output, for any reason. Software that read the HTML to assist users in using WordPress, have big troubles when trying to report so poor HTML to users. The information conveyed is just wrong and our communication to our users just fails. is just an inline comment but wrongly uses the double asterisk. Note: not sure if the preview link input field should be labeled... to my understanding, it is used just to copy the link to the clipboard. If so, we should evaluate a way to make it completely invisible to assistive technologies. @afercia Thanks, I've merged your patch into the PR and tried to resolve conflicts: ​commit. We could eliminate the defaultValue entirely if we instead instantiate the control in JS and pass in the wp.customize.state( 'selectedChangesetDate' ) as the setting once we have #37964 implemented. The control then could be registered entirely in JS and not in PHP at all, and that would avoid us having to create a settingless control to then later link it with another Value. In the same way, with #30738 we could also add the changeset status control with JS and have it linked to the selectedChangesetStatus value, instead of having to create a secondary Value to sync with. We may want to make an array of all of the allowed statuses for changesets, in addition to their saved/unsaved labels. Eventually I could see this as being something plugins would want to be able to filter, and it would be cleaner than having the choices for the status in one place and the translation labels in another place. Is the value test really needed in the preview link input field? not sure if in this case it needs also a rel="noopener noreferrer" attribute, see for example #36809 and #37941. @afercia I believe 42022.3.diff​ addresses all of your feedback. See ​PR. 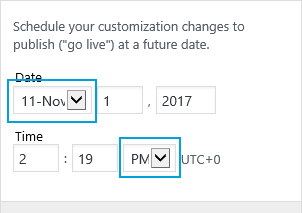 @westonruter noticed add_control( new WP_Customize_Date_Time_Control ... doesn't pass a label to the template, any reason to keep it in the template? Maybe in case it gets reused/extended? are still not correct, maybe this should be handled in #33085 ? @westonruter noticed add_control( new WP_Customize_Date_Time_Control ... doesn't pass a label to the template, any reason to keep it in the template? Maybe in case it gets reused/extended? Yes, let's handle them there. That's the more appropriate place. Good catch. I think the problem here is also that these select dropdowns should have an auto width and not a fixed width, as they can be translated after all. I've fixed that in ​3bd6bf3. Look good? Customize: Fix WP_Customize_Date_Time_Control to be re-usable for plugins and custom settings. Allow time fields to be omitted by constructing with timeIncluded as false. Ensure reportValidity is only called on a control when it is in an expanded section. Improve accessibility and fix HTML validation and style issues for both the date/time control and the preview link control. Fix styling of dropdowns and clean CSS. Improve accessibility of nav menus component. Props westonruter, afercia, sayedwp, melchoyce. @westonruter I think if we are passing 'include_time' => false, the "Date" title becomes redundant and probably should be removed, because it's being described by the label. Note the "Date" is now a fieldset legend, and it identifies all the 3 date fields. It shouldn't be removed. Mayeb consider to remove the bold "Date Established" instead. @afercia the “Date Established” is the label of the field. I think that the “Date” above the month should get screen-reader-text applied to it if not include_time. Thoughts? the “Date Established” is the label of the field. Maybe in Customizer terms is a "label", not an HTML <label> and if it's rendered as a <label> it shouldn't. A <label> is associated to one form field, not 3. That should be just text or the fieldset legend. @afercia That's right. In the Customizer API, a control has a label property which normally gets rendered as a <label>. But in the case of this control which has compound inputs, there isn't one input to link the label to, so a <span class="customize-control-title"> is used instead. For Customizer controls, the label is really just a synonym for title.